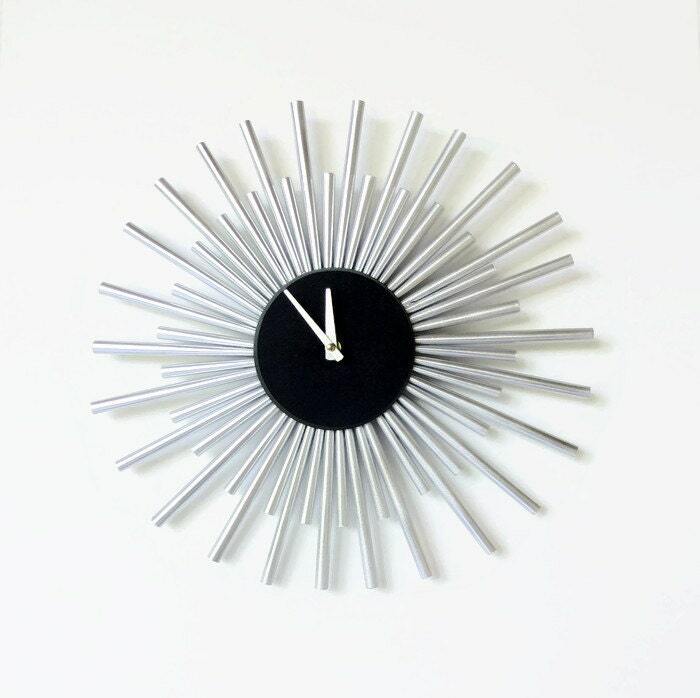 Find your happy place with this large silver wall clock from Shannybeebo Clocks. Custom handmade from reclaimed material, this paper sunburst clock is a eco friendly option for your timing needs. You won't be able to help but smile each time you glance at it. This Mid Century style wall clock is perfect for any room, and makes a fantastic gift for any occasion. This is a Shannybeebo original and can be custom painted using your favorite colors. Clock size is approximately 14" - 16” in diameter. Arrives ready to hang with a metal wall hanger. purchased a set of 3-looks fantastic. Beautiful! It works great and is high quality. I couldn't be happier with my purchase.